The Sony A7 III has been one of the market’s highest-selling full-frame cameras in recent months, thanks in large part to its combination of impressive features and low price tag. But there’s some competition in town – the Nikon Z6, another 24 megapixel full-frame mirrorless camera making waves as Nikon’s first attempt at full-frame mirrorless (along with the higher-resolution Z7). Although both the Nikon Z6 and Sony A7 III have a $2000 price tag, there are some important feature differences between them, too. We’ll compare them in detail below. 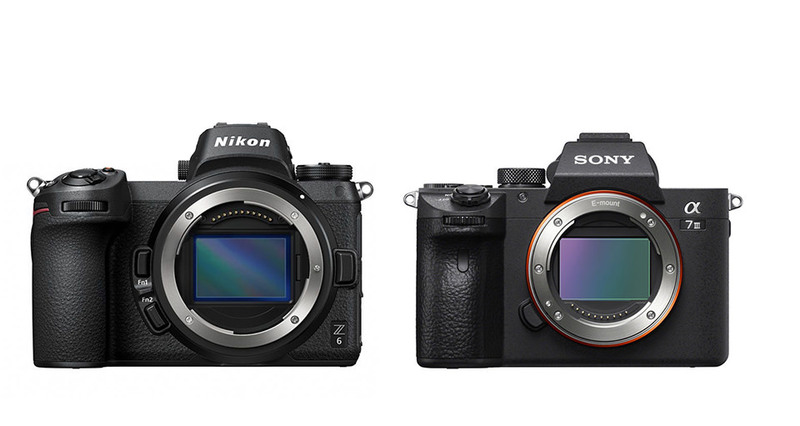 On balance, the Sony A7 III and Nikon Z6 are relatively well-matched in their specifications. Taking a surface-level view, they’re especially similar: 24 megapixel full-frame mirrorless cameras with in-body image stabilization and a tilting LCD screen. It’s also quite true that Nikon took some ergonomic inspiration from the Sony A7-series cameras, with the two having surprisingly similar layouts. As you can see, the Sony A7 III and Nikon Z6 make for good competition! Depending upon the specification you care about the most, you can convince yourself that either camera has the advantage. Specifically, the Sony A7 III has more autofocus points – 693 phase-detect points (and 425 contrast-detect points) compared to the Nikon’s 273 hybrid autofocus points. Although it’s true that the number of autofocus points doesn’t always mean the system is better at things like speed and tracking, it is at least a sign in that direction. And, in practice, the Nikon Z6 has some issues with continuous autofocus tracking in cases where the Sony succeeds – although AF-S (single servo) autofocus is excellent on both cameras, and better on the Z6 based on our testing. The Sony is ahead in its battery life – 610 vs 310 viewfinder shots – and the fact that it has dual card slots. Although it is true that XQD cards are faster than SD, and arguably are the card choice of the future, that doesn’t mean one XQD card is better than two SD cards, at least for most users. I can see this being a major drawback for some photographers who use the Z6, especially wedding shooters. However, Nikon has some tricks up its sleeve as well. Its maximum frame rate is 12 fps, two higher than the Sony’s maximum of 10 fps – which itself is only possible when you shoot 12-bit RAW rather than 14-bit. The Z6 also comes out ahead in terms of its LCD, which is larger and higher in resolution. It also has a higher-resolution, higher-magnification viewfinder – certainly a welcome sight. As for video, the Sony A7 III is an amazing camera, with 4K resolution and 1080p HD at 120 frames per second. The Nikon, not one to go down quietly, also has 4K video and 120 frames per second – and then it ups the game by including 10-bit video at 4:2:2 sampling via HDMI, compared to the Sony’s 8bit with 4:2:2 sampling. Beyond that, Nikon has announced a firmware update to be released later in 2019 that adds RAW video and 12-bit color to the Nikon Z6 (and Z7) for filming over HDMI, clearly ahead of the Sony A7 III. It is also worth pointing out the handling differences between these two cameras. The two cameras have surprisingly similar button layouts, although the labels on the buttons are different. The grip on the Nikon is a bit deeper, while the Sony has an extra programmable button and a dedicated exposure compensation dial (rather than the button + dial arrangement on the Nikon). Both cameras heavily favor right-hand operation. From a usability standpoint, many photographers have criticized Sony’s long and often confusing menu options, while Nikon’s menu system is definitely more mature. However, at least to a degree, this is something you’ll get used to over time – particularly if you only tend to change a few menu options day-to-day. That fact – that you’ll get used to any menu oddities you encounter – is just as true as a general comment on the ergonomics of the two cameras. Aside from things like the comfort of the grip, you’ll generally grow accustomed to using whatever camera you have, so it’s hard to say whether one camera or the other is more “intuitive.” Most likely, if you’re a Nikon shooter, you’ll find the Nikon to handle more naturally; if you’re a Sony shooter, you’ll prefer the A7 III’s ergonomics instead. It goes without saying that these are both excellent cameras, particularly considering their prices. Since both come in at $2000, they are each priced extremely well for the features they offer. If you’re trying to decide between the Z6 and the A7 III, another factor you should consider is the current lens lineup of each system. Although Nikon is certainly rushing to develop as many Z-mount lenses as possible, the fact today is that they’ve only announced three lenses at this point, while Sony has a huge collection. On the other hand, by all indications, Nikon is about to go all-in with their investment in the Z-mount. 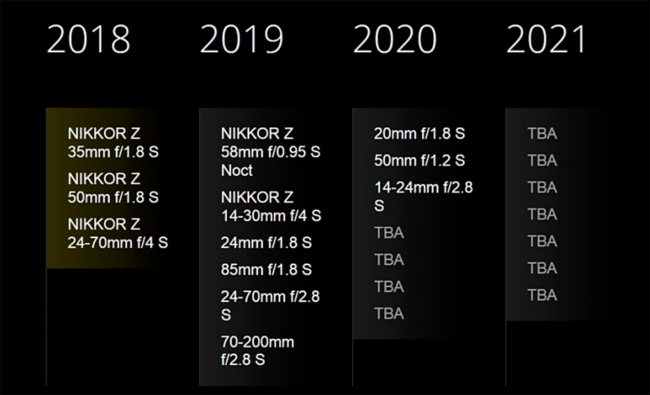 Based on Nikon’s lens lineup, we are going to see new Z lenses released at a rapid pace; Nikon is playing a game of catch-up, and it needs to move quickly. It’s also important to mention that you can buy an F-mount adapter (the FTZ adapter) to use with the Z6, which means that Nikon users with existing lenses have a good reason to stick with their current system. If you have a large set of F-mount lenses, they’ll adapt much better to the Z6 than to the A7 III. Our tests show you don’t lose any sharpness with the FTZ adapter (as shown in our Z7 review), and autofocus works fairly well, although both the Z6 and Z7 autofocus more quickly and in darker conditions with native lenses. Which Camera Should You Get? So, which camera should you choose? Looking at just the specifications above, it is a very balanced comparison, with the Sony arguably a bit ahead, largely due to the existing lens lineup. Then again, if Nikon’s higher-specification viewfinder, 10-bit video performance, or 12 FPS matter more to you than dual card slots and extra battery life, the Z6 could very well be the way to go. I know that more Photography Life readers are Nikon shooters than Sony, and perhaps that’s the answer: Stick with the brand you have, unless you’re worried about the decisions it’s making. Personally, I’ve already upgraded my workhorse D800e to Nikon’s mirrorless system, and I have high hopes for where these cameras will go – but you certainly can’t go wrong either way. The bottom line is that the Sony A7 III and the Nikon Z6 are both at the pinnacle of what a well-priced full-frame camera can be. Although fanboys and anti-fanboys will find it easy to dismiss one camera in favor of the other, both have more than enough features for any reasonable uses. It’s a pretty good time to be a photographer. I think especially for this camera (not as big a problem for the z7, in my eyes) is that Nikon has nothing close to eye-af that Sony cameras have. Needless to say, when doing portraiture or street photography, it’s an incredibly useful feature (especially since you can program the ae-l button to specifically initiate eye-af). All in all, while the z7-a7rIII comparison is a far better one for Nikon, the z6 has far more drawbacks when compared to the a7III. A lot fewer focus points (significantly less than half), just one card slot and half the battery life. On the other side, the lcd has a higher resolution (something I personally don’t care about) and the EVF is definitely much better (which I do actually care about). Still, to me more than anything, that battery life is just not good enough. As a DX user with a camera that has a CIPA of about 6-700 shots, I already have had to use another battery plenty of times in a single day of shooting and the idea of having to carry 2-3 other batteries just to be safe isn’t appealing in the slightest. The abscence of a dual card slot wouldn’t be *as* significant to me but I’m not a professional and I’m guessing that’s the one cathegory that will find it particularly distasteful. Especially considering that the d7200 had two card slots, at what, 8-900$ less than this camera and on an aps-c DX body, no less. It’s unfortunate, honestly, while waiting for the announcement I didn’t think even for a moment that cameras that cost 2 or 3 grand wouldn’t have dual card slots and was actually worried about the abscence of IBIS, more than anything. I guess these things will be rectified in a second iteration of the cameras but as someone who is looking to switch to a FF mirrorless, this makes things more complicated. Bah. I guess I’ll be waiting anyway, honestly can’t wait to see the reviews of z6 and z7 on PL, thanks for the coverage! The dual card slot issue is a strange one, and it’s possible that we are still going to learn more about why Nikon made this decision and what they expect wedding photographers to do as a result. I can see that one steering a lot of people away from the camera, agreed. Well, fewer people ahead of me in the pre-order line, I guess! I think you are right, the first generation of a new lineup will always have some oddities like this. Personally, the battery life issue doesn’t bother me until we see side-by-side comparisons of how the Z6 and Z7 compare to existing cameras on the market. I use my D800e almost exclusively in live view anyway for landscape photography. I suspect the Z7 will not be worse in that respect – probably better, even. Yes, it indeed is a mystery to find that Nikon didn’t provide 2 card slots in any of their mirror less models, whatever might be their reasons. And it’s even more strange when you consider that they have been a trendsetter with 2 card slots with their Dx version DSLRs. This may seriously put-off many serious shooter who were waiting for mirror less versions from the Nikon stable. The battery life has been proven to be much much better on the Z cameras than the tests revealed. I wouldn’t worry about battery life on the Z. It’s the buffer that I am concerned about. Single memory card slot is a big big drawback. And then the inability to meter with Al and AI-S lenses through the FTZ adopter is another negative. While I am sure Z6 will be fantastic camera no doubt, the above 2 drawbacks is holding me back. But many many thanks for your great coverage. It appears that FTZ adopter will allow metering with AI and AI-s lenses and one can use focus peaking too. I have DX format camera (Nikon D7000). I am wondering, if my DX lenses (18-200, 10-24, 85 micro, 35 F1,8) are compatible with Z6 camera (and Fxz converter)? You will get only cropped resolution. I do not know exact resolution. Spenser will reply once he has time. The FX AF-S 70-300 however should work with full functionality. This sounds good, I’m curious about the resolution. Under the A7iii specs you list “10 FPS with limitations (no viewfinder image, only 12-bit RAW)”. The viewfinder shuts off when shooting high speed??!! Seems to be unusable if true. Thanks for pointing that out, it was poorly written – what I meant is that there is no live viewfinder video feed. Instead, it shows you the images you have captured. So, it is more jittery and a bit delayed, because there are fewer FPS. Just fixed it! I don’t think the Sony has TTL but pretty sure the Nikon does. I think this is reversed. I think both cameras are weather resistant but the Nikon is weather sealed. I don’t think the Sony is. I didn’t want to make a definitive statement on weather sealing at this point, since we have not yet used them side by side. Both claim to be weather sealed in their marketing, although the Sony is apparently not fully sealed on the bottom plate based upon some teardowns. Is it reasonable to expect a comparison to the Fujifilm XT-3 when it is released? How do the Olympus mirrorless cameras fit into this discussion?? photographylife.com/nikon…nikon-d750, Meter Detection Range	-4 EV to 17 EV but in photographylife.com/nikon…nikon-d750, Detection Range	-2 to +19? The -4 to 17 number is meter detection range, while -2 to 19EV is autofocus detection. Hope that helps! as a heavily invested nikon user, im disappointed. all they were supposed to do is make an a7III with better tweaked features. 1 card is a big problem for me when shooting weddings. we can argue the facts why they made it only 1 and I know it wasnt because any technical issue was holding them back. this was intentional. I was looking for a video camera that can also do stills. one card slot and from the early specs VERY bad battery life, makes it an easy choice for me to get the a7III and it saddens me to do it. I really dont like sony but buying it from lack of choice. I work with a photographer who has videographers shoot for him and he had 2 separate issues with videographers who shot with 1 slot cameras who had corrupted cards that were sent out to be recovered and the price is VERY expensive. so I dont want to take any chances knowing the nightmare he went through. I dont want a day to come along when god forbid something happens and I get pissed at myself for choosing the nikon knowing a bad day can come along. Why no one is talking about Factory warranty? Nikon 3 Years vs SONY 1 Year!